The last 4 years seem to have flown by and it’s that time again: the FIFA World Cup. As I’m sure you’ve heard on every TV channel and radio station and in every newspaper, this year five-time champions Brazil, and the only team to have played every World Cup, are hosting the enormous event. The country has promised to share its vibrant and diverse culture with the millions of visitors and spectators throughout the globe with a plethora of art,music, dance and food festivals. 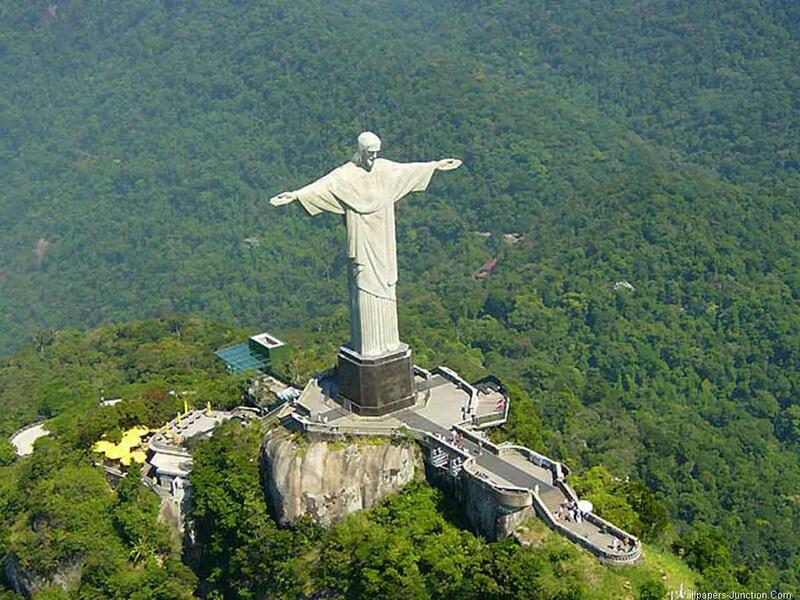 The 12 host cities boast a wide variety of visitor attractions including the stunning opera house in Manaus; the luxurious sandy beaches in Natal; and of course the infamous Christ de Redeemer statue in Rio de Janeiro, one of the new Seven Wonders of the World. The 62 World Cup matches will be held in 12 stunning stadiums in each of the host cities, which have been newly constructed or renovated for the tournament. The main two are the Arena de São Paulo in (you guessed it) São Paulo and Maracanã in the carnaval city Rio de Janeiro. Despite the excitement of avid football fans across the globe, since it was announced in 2007 that Brazil had won the 2014 bid by a unanimous decision, Brazilians have varying opinions. The total cost of staging the World Cup has far exceeded the predicted amount and is currently estimated at 11 billion dollars, which has infuriated Brazilian inhabitants. Anti-World Cup protestors have taken to the streets in large demonstrations, many of which have escalated and ended in violent clashes with the police. They are up in arms about the fact that so much time, effort and money is being put into the tournament when many people are living below the poverty line with poor schools and hospitals. Young artistic protestors have taken to expressing themselves through graffiti. 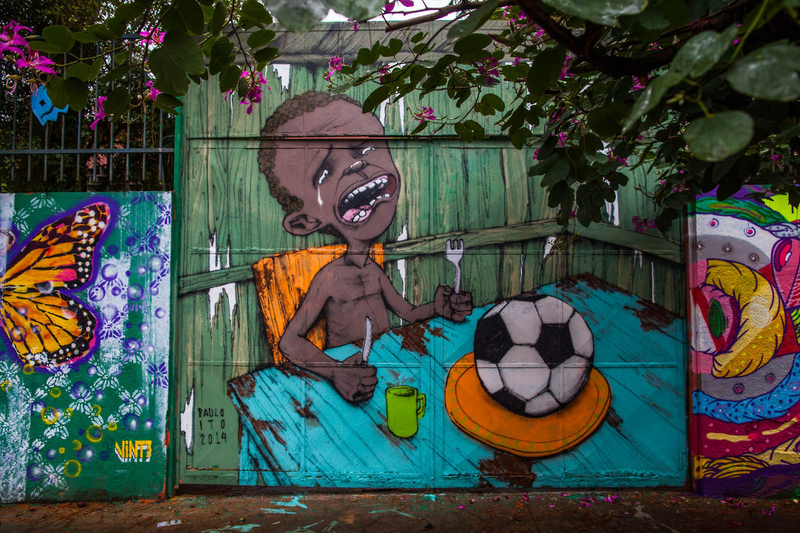 The most shocking is the graffiti below which shows a young, severely malnourished child being served a football for dinner rather than food. In the latest spate of protests which occurred only last week, more than 1,500 people were said to have taken part. Metro workers’ strikes have caused chaos in São Paulo, disrupting more than 200km2 of traffic to a standstill. Strikes have also occurred on trains and buses throughout Brazil’s busy cities. Fortunately a 24-hour airport strike in Rio has been postponed otherwise millions of visitors would have missed the first World Cup matches! Despite organizers continuing to stress that the money brought in from the tournament will have a significant positive impact on the whole country, there are many despondent faces in Brazil today. In addition to the protests, many concerns have been raised about whether the stadiums will be completed and also about the safety of those working on them. Back in January this year, more controversy arose as stories emerged that five of 12 the stadiums would not be finished in time for the big event. Completion dates were continually extended due to severe safety concerns for workers following injuries and 2 fatalities as a crane fell onto the roof of the Sao Paolo stadium. According to the BBC, FIFA threatened to strip some of Brazil’s cities of their host status, saying ‘No stadium, no match’. Although this was narrowly avoided, concerns are still rife. Reports hit the headlines on Sunday as the junior match in São Paulo left 20,000 people standing as temporary seating was not declared safe. Even now, the first official match in São Paulo will be played without a proper safety test event that FIFA carries out in newly erected and renovated stadiums. Can the tournament take place in stadiums that aren’t properly finished?